When Jesus says NO doors are just beginning to open! What happens when Jesus says no? If I would have kept score of the times I’ve asked Jesus to heal me or get me out of a bad situation the times He said NO far out numbers the times when He said YES. It took me a long time to accept the fact that Jesus would say NO to me because I always thought my needs where serious enough cause Him to jump into action almost immediately (he did, read on). But over the course of the past 4 or 5 years I have discovered that Love means having the courage and the foresight to say no when circumstances warrant saying NO. The first time I accepted Jesus telling me NO happened in the summer of 2011. Patti and I headed home from my Pulmonary Doctor who had just told us I had a nonaggressive form of Pulmonary Fibrosis. I wanted to talk to Jesus about it so minutes after arriving at home I was on my bike headed for a ride with Jesus. Twenty minutes or so later I sat down on a park bench and was told (not audibly), “This will not end in your death.” Jesus had said NO to a healing even before I asked Him. For the first time I wasn’t disappointed, and I didn’t say, “But Jesus.” Then later in the summer of 2013 when we were told I would need heart surgery I had a similar experience. We know the answer to my original question, what happens when Jesus says NO don’t we? But in case you don’t remember, “Three different times I begged the Lord to take it away. Each time he said, “My grace is all you need. My power works best in weakness.” So now I am glad to boast about my weaknesses, so that the power of Christ can work through me.” (2 Corinthians 12:8–9, NLT, emphasis mine) Remember “Footprints in the Sand,” the story about seeing only Jesus footprints in the sand because he was carrying one or all of us? That’s a wonderful illustration of God’s Grace in action. I know there are times now when Jesus’ may not be carrying me but He increases my lung capacity by lending me His breath, and when my heart starts faltering His heart beats in tune with mine. That is God’s Grace in action in the life of Gary Piper! 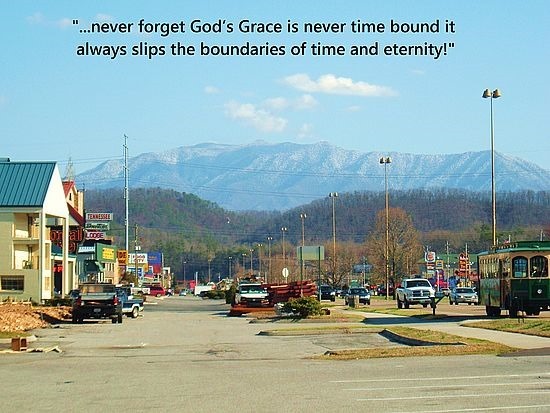 One of the most valuable lessons I would like to pass on to you is simply, When Jesus says, “NO,” you say, “YES, I’m trusting in Your Grace God!” Oh, one last thing, never forget God’s Grace is never time bound because it always slips the boundaries of time and eternity! My verse this year is Isaiah 26:3 “I will trust in the Lord forever, for the Lor, the Lord God is the rock eternal.” Thanks for the reminder to fall into that verse when God says “no” . This is a valuable lesson for us all because He loves us enough to say no to our whims, emotions and sees the road much better than we do!